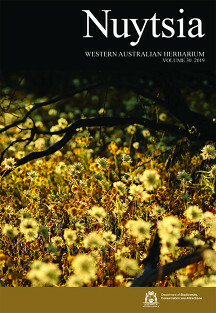 Search the Flora of Western Australia using extra name and descriptive fields not available through Quick Search (at the top right of screen). The database contains over 24,220 records of name and descriptive information on the state’s flora — including many lichens, bryophytes, algae and fungi. Alternatively, you can browse the taxonomic hierarchy for information on plant families, genera and species. An illustrated revision of Tribonanthes (Haemodoraceae) was published today. Licea xanthospora is a slime mould (Myxomycete) that occurs in the Charnley River and Bachsten areas in the Kimberley region. Our first publication for 2019 released today includes a summary of changes made to our vascular plant census in 2018 along with papers on Acacia, Gastrolobium, Eremophila and Scholtzia.